I'm about to say something that will sound heretical: I'm not surprised that God loves me. Wait, what?! I'm not entitled to say that, right? Because I'm a terrible sinner, and He's perfect, so I should be totally unloveable. Right? Right. But because of Christ's death, the Father has adopted me into His family. And it logically follows that a God who would go to such great lengths to have a relationship with me would love me in and through and because of and for that relationship. He's infinitely loveable, more beautiful than all other desires. But I was born with a wicked heart, one that is bent in toward myself, one that takes tiny created things and makes them into gods for me to spend my life worshiping. I'm inherently unable to view things through a lens of truth. Truth is all around me, to be sure. But my natural eyes are too blind to see it. So it continues to shock me every day, when I find myself growing more in love with Him all the time. When I want to read His Word. When I want to obey Him more than I want to do my own thing. And I know that it must be His love for me working within me to produce this love for Him. Because I don't know how to love good things on my own. 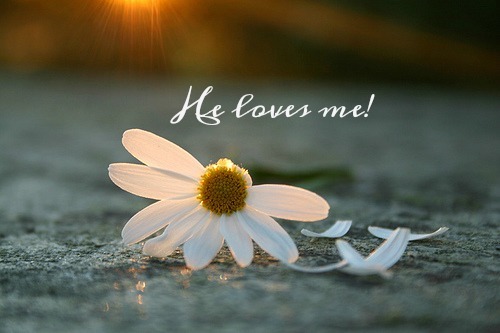 I'm stunned by my love for Him, because it is the most gripping, obvious, undeniable evidence of His love for me.